The Holiday Inn Express Hotel & Suites Evansville offers 69 guest rooms with 24 one bedroom suites and 6 whirlpool suites. 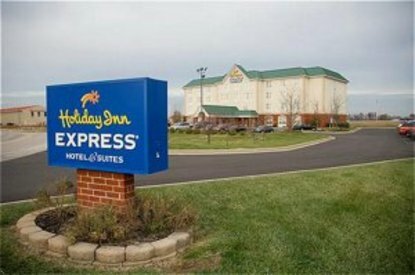 The Holiday Inn Express Hotel and Suites is located at the northwest corner of I-164 and Lloyd Expressway on Evansville's East side. The hotel features complimentary hot breakfast and free local phone calls. Visit Evansville, and Stay Smart at the Holiday Inn Express Hotel & Suites. Conveniently located just five miles from the Evansville Museum of Art and the Reitz Home Museum. This Evansville hotel is close to popular attractions like the Casino Aztar, Eastland Mall, historical New Harmony, historical Newburgh and Mesker Park Zoo with the new Amazonia. There are a wide variety of restaurants and cocktail lounges located in the area. The Evansville Dress Regional Airport is 10 miles from the hotel. Ivy Tech University, the University of Evansville and the University of Southern Indiana are also nearby. Free deluxe Continental breakfast, free hard wired and wireless high-speed Internet and exercise room. Also we offer discount passes to Tri-State Athletic Club, Evansville's premier private health club for our guests. 100% smoke free hotel. This hotel is committed to providing accessible facilities under the American Disabilities Act. If your accessibility needs are not met, please contact the Hotel Manager on Duty. Should you require additional information regarding accessible facilities for guests with disabilities, please call 1-800-Holiday (U.S. and Canada) or contact the hotel directly. For the hearing impaired, TDD service is available at 1-800-238-5544 within the U.S. and Canada.